I picked up some fresh fruit this week from a local farmer and started plotting the perfect way to use my watermelon right away! What I came up with did not leave my family disappointed! My husband and I love watermelon. My daughter is interested in it, but not sure if she is a fan yet. My son normally won't touch it. 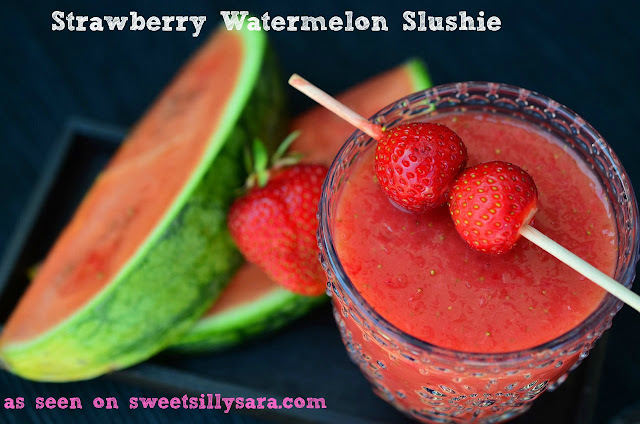 I made this Strawberry Watermelon Slushie from 2 ingredients and it was an amazingly simple, sweet summer time treat! I am giving you 2 recipes to make it also, just in case you require instant gratification. Place your chunks of watermelon into the freezer for about 30 minutes. Next place frozen chunks of watermelon and fresh strawberries into a blender on a medium to high setting, blend until smooth. Blend watermelon and strawberries until smooth, gradually adding ice to the blender. Do you make healthy slushies at home as a treat on a hot summer day? They make a wonderful alternative to the gas station varieties and this one is super easy to create. I'm going to have to pick up a watermelon. I don't enjoy the mess, but I sure do love the flavor. This looks like a great way to savor it. Oh yum!! This looks to die for! Give me ideas for my last ditch effort to save the last couple of weeks of summer! Thank you for Linking up with us at the Tips and Tricks Link Party! I can't WAIT to have a completed kitchen where I can make this ASAP!